As your guests are arriving, give them each a nappy or baby pin to wear on their top. Once everyone has arrived, the rule is that no one can say the word ‘baby’ for the rest of the shower. If you hear someone say the word, you can take their pin for yourself and the winner is the person with most pins at the end of the shower. For this game, put 10 common baby items into a nappy bag. Small things such as a rattle, dummy, bib, bottle, baby booties and cuddly toys all work well for this. Give each guest a pen and paper before passing the nappy bag around. Everyone has to put their hand into the bag and guess what the items are by touching them – the person with the most correct answers at the end wins. Buy 7-10 yummy flavours of baby food and place into bowls with a number sticker attached. Give every guest pen and paper then they have to taste each baby food and guess what the flavour is. The person with the most correct answers wins. Yum! Print out a poster sized side-on photo of the mother-to-be standing with her pregnant tummy and stick to the wall. Blindfold each guest and give them a cut out picture of a baby and a pin. After spinning each guest a few times – don’t let them get too dizzy – guide them to the wall and let them pin the baby onto the mummy. Whoever gets closest to the mummy’s tummy is the winner, but no peeking allowed! Buy a selection of baby onesies in varying sizes, enough for each guest to have one. Put them out on a table along with some fabric paint and fabric pens. Now ask your guests to decorate their onesie however they like – including sweet messages for the baby. They can read them once they grow up in the future, making a set of lovely mementos of their early years. 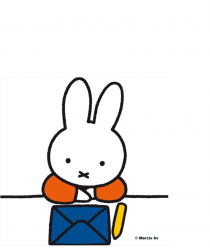 Why don’t you draw a picture of Miffy on one? Miffy can’t wait to play and celebrate with you!